I started working at my dad’s bakery when I was 14 years old. I reckon that’s about the same age as my siblings, all of whom worked for Dad for varying number of years. My brother will argue that he worked for Dad (unpaid) from the time he was 2. That in fact may be true. He was the only boy, after all, and so destined to be a baker, at least in my Dad’s eyes. Which, I might add, became true. All this is to say that when I was 14 years old (hmmmm, somewhere in the neighborhood of 1967 or 1968), bread was 29 cents a loaf. But more to the point of this blog post, doughnuts (or D-O-N-U-T-S as they are now commonly spelled) were 65 cents a dozen. A DOZEN. The very best glazed doughnuts that you can imagine. Doughnuts that were so light they practically floated in the air according to one of my cousins who was well acquainted with the bakery. I am quite familiar with inflation. Store-bought bread now costs somewhere between 3 and 4 dollars a loaf, and it isn’t even half as good as that my father made. But I also probably earned something like a buck fifty an hour. It’s called inflation, and it’s inevitable. Still, it didn’t stop me from being shocked recently when I purchased doughnuts to treat a friend of mine. I had offered to bring breakfast or lunch to her house. She is going through chemotherapy, and so when she told me the one thing that sounded good was doughnuts, well, I was more than happy to comply. First (and I assure you, foremost) because I want to be a good friend, but second, because I LOVE DOUGHNUTS. I always have; I always will. They are flat-out delicious. Then we went through a doughnut phase. 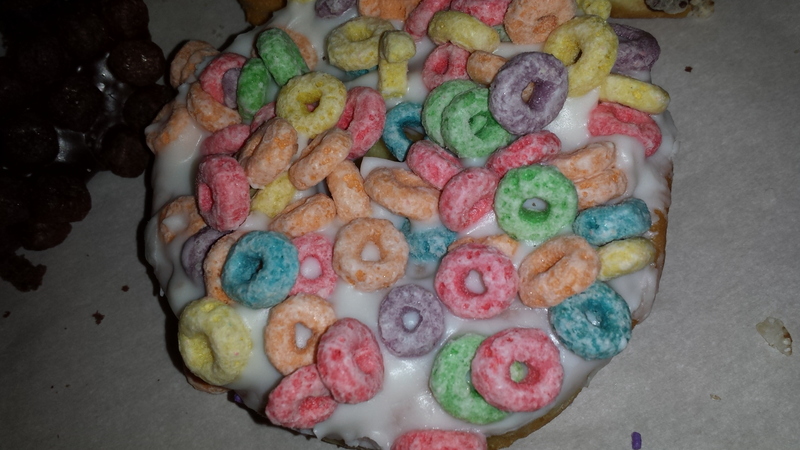 Krispie Kremes were built all over Denver. There were lines like at an Adele concert to purchase these sweet treats at all hours of the day and night. After a couple of years, you could hear the sound of crickets chirping at the doughnut shops, and they began to close down. My dad would have said (and my brother would concur), “Good riddance to bad doughnuts.” He didn’t think much of Krispie Kreme doughnuts, and I admit that, while there’s nothing quite as good as a warm Krispie Kreme glazed doughnut, after they have cooled off five minutes later, they’re just ordinary. Haters, don’t hate. But back to my most recent doughnut purchase. 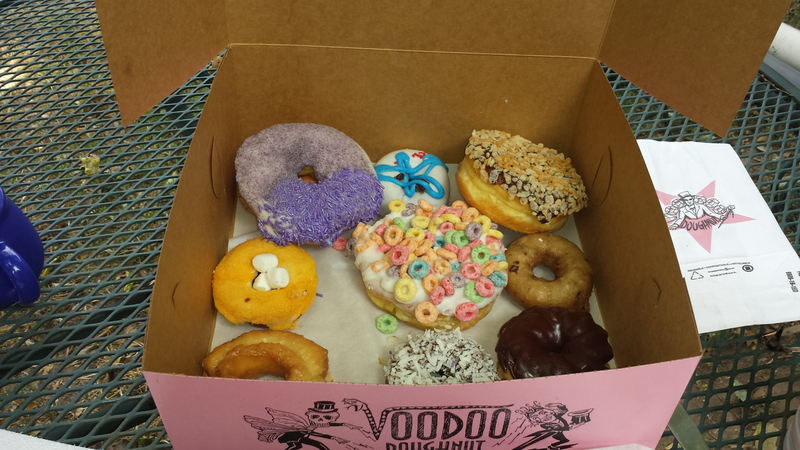 There is a doughnut shop that opened up maybe a year or so ago called Voodoo Doughnuts. The original store is in Portland, OR, and they have only opened a couple more following their rip-roaring success there – one in Denver, and most recently in Austin, TX. We were in AZ when the Denver store opened, but there were apparently lines blocks long to purchase these doughnuts. The bakery is far from my house, so I have never bothered to go. 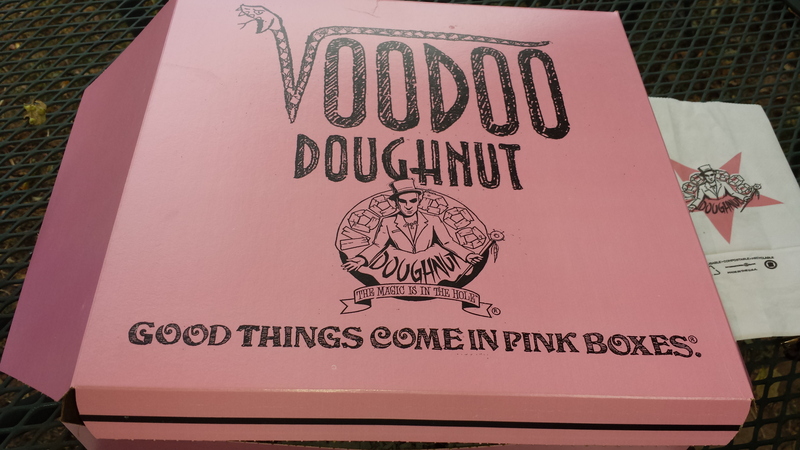 However, I knew that my friend likes these particular doughnuts and it is located very near her house. That’s where I decided to go. It was midmorning when I got there, so the lines had died down. I only had a short wait. Which was just enough time to get over my shock when I saw the price of a dozen doughnuts. My friends, a dozen of mixed doughnuts was $15. For 12 pieces of dough covered with frosting. I bit the bullet and made my purchase. When I got to my friend’s house, she poured me a cup of very good coffee and we had our doughnuts in her back yard. I will admit that the yeast doughnuts were quite tasty. The cake doughnuts, well, maybe a bit of a disappointment. Perhaps it was the grape Kool Aid coating. And you think I’m kidding. Our favorite doughnuts these days come from Basha’s markets in Arizona, where, shockingly, my brother works. But I know doughnuts, and I know they are exceptionally good. And they cost – wait for it – 75 cents apiece. 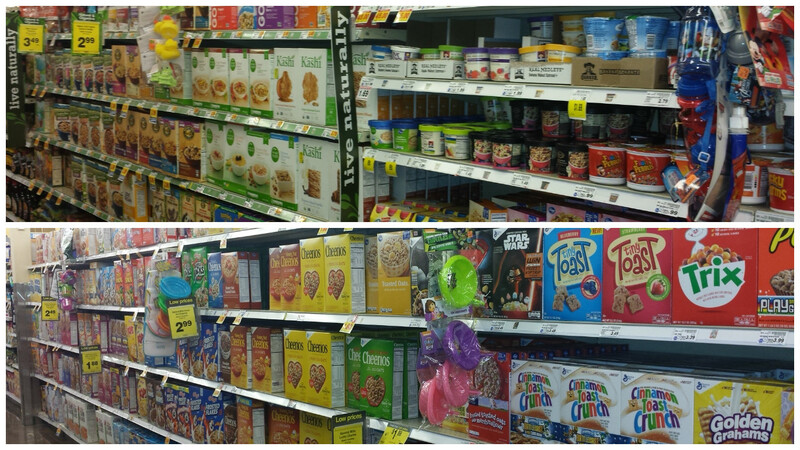 But no Fruit Loops. By the way, since parking was hard to find at Voodoo Doughnuts given that it is located just this side of the state capitol building, I took a chance and parked illegally where a sign warned me not to park. As I walked back to my car, I saw that a patrolman was writing me a ticket. I thought about offering him a Kool Aid doughnut as a bribe, but he pulled away just as I walked up. So add another $50 to my dozen doughnuts!